Ben Robinson|GoBuccs.com Covington’s Kleyton Maschino soars toward two points Friday night against Newton. Ben Robinson|GoBuccs.com Newton’s Ryan Mollette drives between two Covington players for two points. PLEASANT HILL. — Holding a 36-26 lead with just under 6:00 left in the game, the Covington Buccaneers had the ball and were patiently setting up a high percentage shot. It was a strategy Covington had used in half court sets through out the contest, which put Newton in a bind. With 5:13 showing on the ticker, Covington found the shot it wanted – a seemingly easy layup. 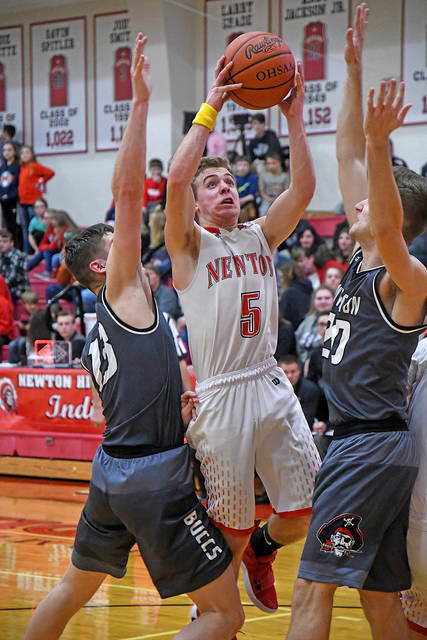 The layup spun out of the rim and into Newton’s hands and the Indians quickly pushed the ball up the floor for a layup of its own by Ryan Mollette. It was the turning point as Covington failed to push the ball across mid-court on five straight possessions as Newton went into a full court press. Five straight Buccaneer turnovers turned into points for the Indians in under two minutes. And quickly, a ten-point Buccaneer lead became a 38-36 deficit with 3:30 to play and in the process Covington found itself in foul trouble with their two leading scores (Andrew Cates and Kleyton Maschino) sitting with four fouls. The tone of the game had changed and Newton scored 23 fourth quarter points on three buckets and 16 of 20 free throws. 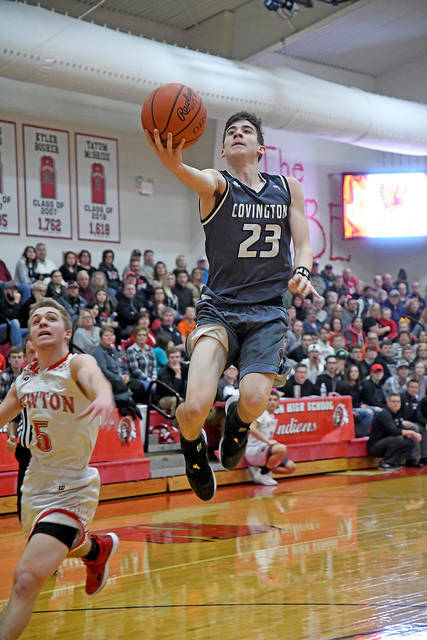 Covington, who had executed its game plan very well through the first three quarters, managed just five points in the final frame on buckets by Maschino and Spencer Brumbaugh to go along with a free throw by Chad Yohey. And the execution by Covington was evident in the opening frame as the Buccs jumped out to a 17-7 lead on treys by Cates, Tyler Fraley and Maschino — along with three buckets and two free throws. Newton cut the Buccaneer advantage to three points at the break, but the Buccaneers reclaimed the momentum by pushing the lead back to double digits, 36-26. However, Covington squandered a golden opportunity to build an even wider margin in the third as a Buccaneer was called for a foul and then a technical foul immediately thereafter. Newton converted on the two free throws and then Mollette drilled a trey for a five-point possession. Neither team could score over the first two minutes of the final frame, which set the stage for the game-changing sequences that led to a come-from-behind win by Newton. Mollette led all scorers with 19 points, while Chet Jamison dropped in 18 points for the Indians. Maschino led Covington with 13 points before fouling out and Andrew Cates scored nine points. In all, Covington converted on 10 shots from two-point range, four shots from behind the arc and made nine of 13 free throw. Newton made eight two-point field goals, four treys and converted on 21 of 28 from the free throw line. Covington ends its regular season with a 5-16 record as it takes on Fort Loramie at 7:30 p.m. Friday in Piqua D-IV action. Newton has a first-round bye in the Troy D-IV sectional and will play the East Dayton Christian-Legacy Christian winner at 7:30 p.m. Feb. 26. Newton begins tournament play on February 6th against the winner of the Legacy Christian and Dayton Christian contest. https://www.dailycall.com/wp-content/uploads/sites/30/2019/02/web1_kleyton-maschino-2.jpgBen Robinson|GoBuccs.com Covington’s Kleyton Maschino soars toward two points Friday night against Newton. https://www.dailycall.com/wp-content/uploads/sites/30/2019/02/web1_ryan-mollette.jpgBen Robinson|GoBuccs.com Newton’s Ryan Mollette drives between two Covington players for two points.